CLEVELAND, Ohio—A leading member of the Senate committees on intelligence and armed services told the Washington Free Beacon on Monday that the Obama administration lied to Congress and the American people about the parameters of last summer's nuclear agreement with Iran. Sen. Tom Cotton (R., Ark. ), responding to questions from the Free Beacon, said he was "truly shocked" by breaking reports earlier this afternoon showing that the Obama administration struck a secret side deal with Iran that would lift key nuclear restrictions on the country in less than a decade, placing it within six months of a functional nuclear weapon. The report was touted by deal critics as a smoking gun proving that the Obama administration misled the public about the deal's contents in order to stymie opponents. The deal was touted as keeping Iran from a bomb for 15 years, but the new disclosures reveal that Iran could be six months away from a bomb within a decade of the deal. Multiple congressional inquiries seeking documents and information about the administration's secret diplomacy with Iran have been rebuffed in recent months. Cotton told the Free Beacon that the latest reports, first published by the Associated Press, are not surprising to him and comport with past nuclear agreements that were hailed as stopping North Korea from obtaining a nuclear weapon. "It would not be surprising to me at all to these those restrictions in the nuclear deal lifted, or Iran violate them in the meantime," Cotton said in response to questions from a Free Beacon reporter during an event hosted in downtown Cleveland by the Atlantic‘s Steve Clemons. When pressed to offer a response to claims that the administration misled lawmakers, Cotton sarcastically responded, "I'm shocked that the administration misled the American people about Iran. I'm truly shocked." The Free Beacon also asked Cotton about recent reports showing that Iran recently completed its fourth ballistic missile test, an action that violated United Nations Security Council Resolutions. Cotton said these tests are aimed at creating unease in the region and sending a message to countries such as Israel and the United States. "Iran has plenty of missiles that can reach their adversaries in Sunni countries or Israel," Cotton said. "There's only one reason for them to be testing ballistic missiles and that is told hold at risk at first Europe and then the United States of America." 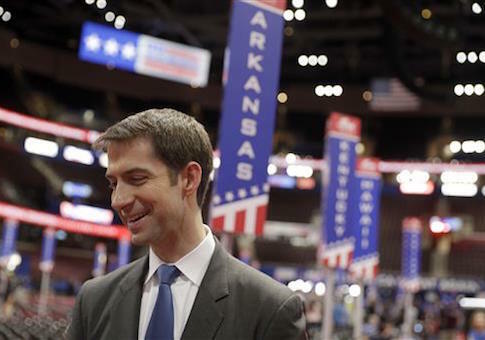 Earlier in his remarks, Cotton recommended the United States abandon the nuclear deal—a position that runs counter to Republican presidential candidate Donald Trump, who has said he would work to renegotiate the deal rather than kill it. "The deal is not in our national interest so I would suggest walking away from it," Cotton said. "The deal in the long term does not serve U.S. interests." Rather than moderate Iran as deal supporters backing the administration promised, the agreement "empowered Iran to be more aggressive," Cotton said. "The ayatollahs know the United States wants it more than they do. … They can even cheat on the deal itself and the United States is not going to hold them on it." "Obama administration told the public that this deal would keep Iran a year Iran away from a nuclear weapon for as long as it lasted. Now, it turns out that Iran will be near months away from a bomb after 10 years. And yet the deal's defenders are still saying that Congress can't act against Iran for the full 15 or more years that the deal supposedly existed."